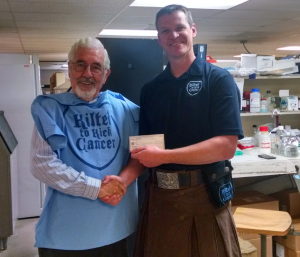 Kilted to Kick Cancer | Get Kilted! Get Checked! 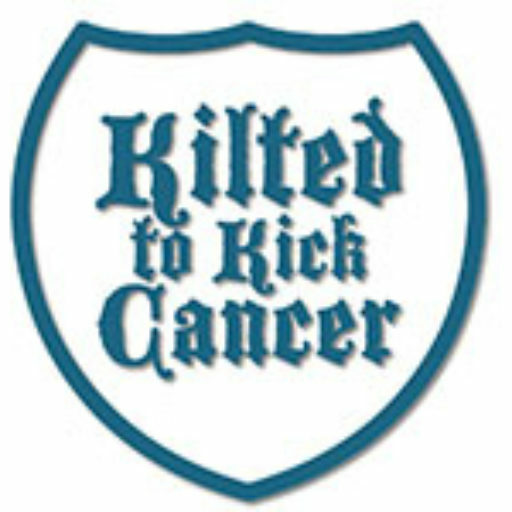 What is Kilted to Kick Cancer? 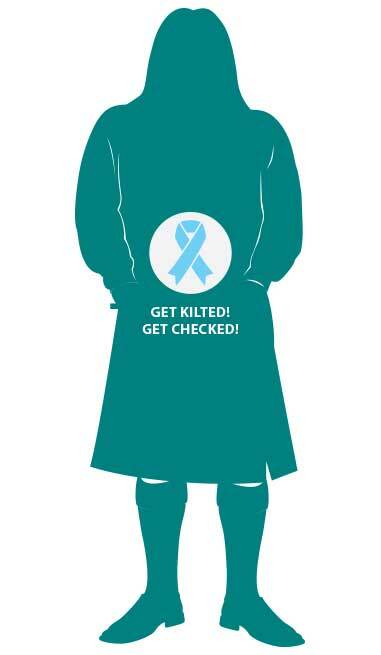 GET KILTED – GET CHECKED! That is not only our motto, but our rally cry! September is Prostate Cancer Awareness month. For the entire month of September we will be wearing kilts. Not just occasionally or when we feel like it. All. Month. Long. Unless we’re on duty (many members are Law Enforcement, Fire or EMS officers), we’re wearing kilts. You mean aside from being the most comfortable garment ever invented by man? I have never been asked why I am wearing a pink T-shirt. I have never had the desire to ask a man with a mustache why he has it. When a man walks into a room wearing a kilt, everyone has the same question…what’s he got on under there? A kilt demands attention anywhere it goes and we use that attention to start an awkward conversation with men of a certain age. Most often it is their wives that approach us and get the info, no surprises there. Kilts attract the ladies. Kilt up, get the facts, go about your business. No walk-a-thons, no branded shampoos, just a man, a kilt and a message…multiplied 10,000 times. 1 man in 7 will be diagnosed with PC in their lifetime. 1 in 36 will be killed by it. Early recognition and treatment, often with simple changes to diet and exercise, can drastically improve survivability from 28% to 100% in your lifetime. If you’re age 40 and of African American descent or in a family with a history of PC, talk to your doctor about a PSA blood test. If you’re 50 talk to your doctor about your PSA and digital exam. Knowing your risks could save your life. Get Kilted! – Get Checked! We all know the PSA test is just the beginning of the Prostate Cancer screening process but the folks at UCSF have some ideas about looking for biomarkers within a man’s blood that can tell us more about their risks for cancer, their cancer status and whether or not the cancer may be agressive or something to keep an eye on. We are developing novel biomarkers based on small bits of genetic material called micro RNA (miRNA) which are increasingly understood to regulate a host of biological processes. By developing new technology to analyze the full set of miRNA present in a man’s blood, we expect to be able to identify miRNA that can combined to yield a “genetic signature” which can help men predict how their prostate cancers will behave and which ones need treatment. A gift would allow us to jump-start development now and be invaluable as we prepare for a large research grant which if funded will allow this work to proceed over the next five years. Thus accelerate our progress toward better risk prediction for men with prostate cancer. 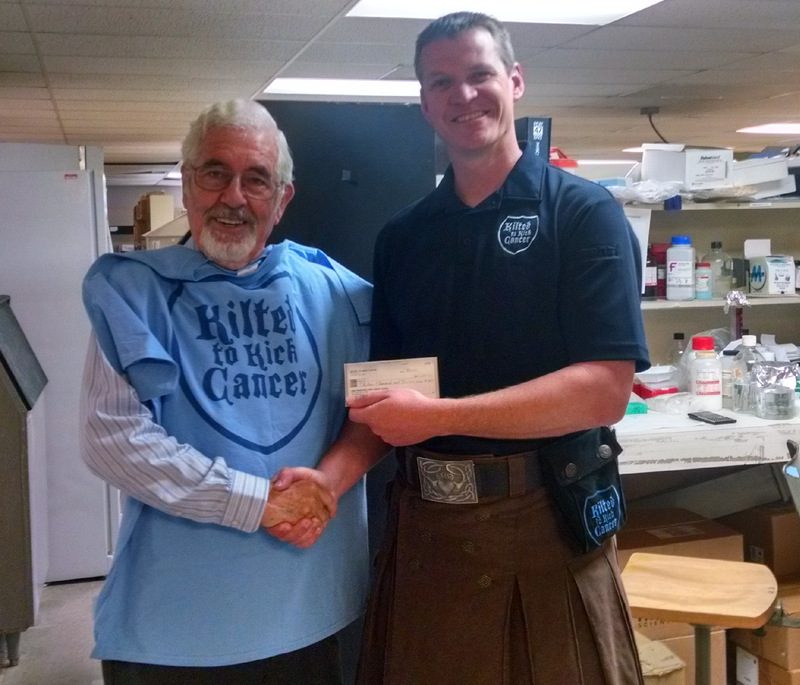 Kilted to Kick Cancer was honored to kick start this research in October of 2016, handing $20,000 directly into the hands of Drs Cooperberg and Carroll to begin laying the groundwork for this research. This study applies targeted cryosurgery techniques in mice and rats with the goal of moving to human trials with additional funding. Early studies show great promise and Dr Barken and his colleagues see great potential. 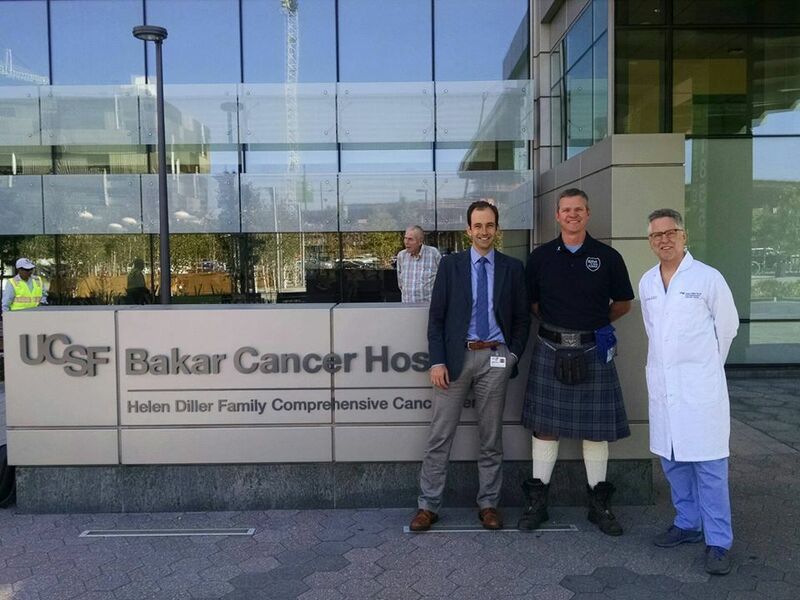 Dr Israel Barken from PCREF and Dr Robert M Hoffman from AntiCancer led an amazing tour of the laboratory capabilities Dr Barken and his team will use to research Prostate Cancer Treatments. While there Co-Founder and President Justin Schorr presented Dr Barken with a $13,000 award to begin assembling his researchers. The team is using the funding solely on research. No overhead. This means that every cent goes towards lab time, researchers, animals and supplies. We will also have regular updates from Dr Barken and the team to know our funds are making an impact on research. Official kilt sponsor ALT KILT is a family shop making custom unique kilts and accessories. This isn’t your grandfather’s tartan kilt. Cotton, leather and other fabrics come together to make a simple black kilt for daily wear or an elaborate embroidered steam punk inspired welder’s kilt. Order your KTKC Shirt and grab a few patches in the menu bar at the top of the page. Join the fund raising competition and support cancer research and prevention while earning bragging rights until next year! When you do get stopped in your kilt the conversation has started! Make sure you know what to say! Men need to talk to their father, uncles, grandfathers and brothers about their cancer status and relay that information to their doctor. Prostate cancer screening begins with a blood test and if caught early can be successfully treated. Scroll down for the basics and learn more at Prostate Cancer Foundation. While we do encourage creative ways of getting the cancer prevention message to men, the core of our September movement is to simply go about our business as if we were wearing pants. While you will have the best month on record and October 1st is a sad day, walking the grocery store, church, getting the kids at school and everything else we do daily gives us a chance to make a difference in our own community. Treatment options and prognosis depend on the stage of the cancer, the Gleason score, and the patient’s age and general health. With greater public awareness, early detection is on the rise and mortality rates are declining. Prostate cancer is the second leading cause of cancer death in American men, behind only lung cancer. About 1 man in 38 will die of prostate cancer. Prostate cancer can be a serious disease, but most men diagnosed with prostate cancer do not die from it. In fact, more than 2.9 million men in the United States who have been diagnosed with prostate cancer at some point are still alive today.